Dedicated to Nick Saban, SR.
With the character of a Mercedes-Benz SUV, a sporting soul and a compact footprint, the redesigned GLA is agile, adventurous and adaptable. It’s at home in the city, eager when you’re far from home, and a perfect fit for today, and tomorrow. Taut, trim and muscular, the GLA is big on style even in its smallest details. New front and rear styling is fresh yet iconic. New wheels range from 18 to 20 inches. Every line is strong yet refined, true to the character within. 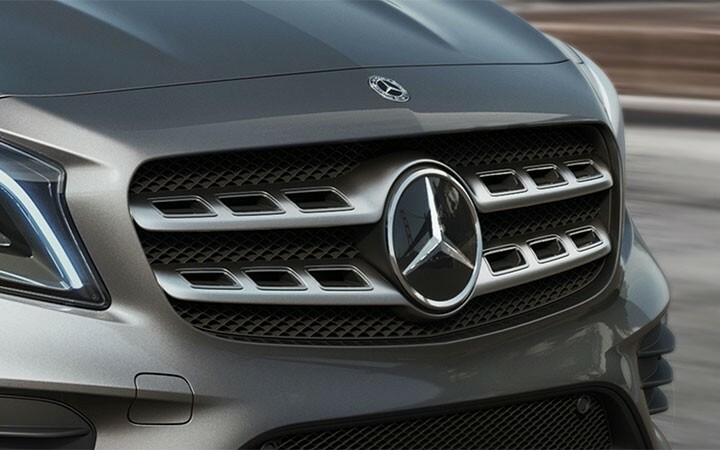 Confidence comes from many factors, but it comes alive in the GLA: From its turbo to its tight turning circle, it’s a quick-witted, surefooted, fun-loving SUV that’s propelled by a legacy of motorsports victory and performance innovation. 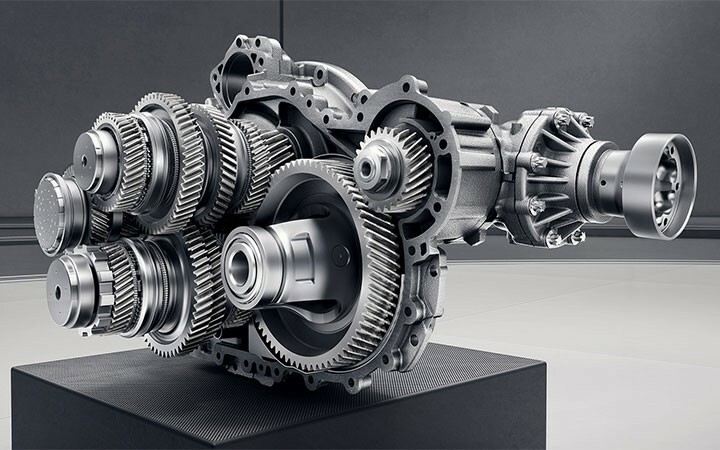 The 7G-DCT transmission’s offers the smooth refinement of an automatic with sporty reflexes. Its dual-clutch design shifts faster than a human can. While its shift paddles let you take charge of its seven speeds anytime. Available variable-torque 4MATIC® all-wheel drive can sense the very onset of wheel slip, and instantly reapportion up to 50% of the engine’s power to the rear wheels on demand. An Off-Road mode makes the GLA even more capable. Whether you need to be connected or want to feel protected, the GLA surrounds with advanced technology that’s designed to enhance your life on the go, even when you’re away from your Mercedes‑Benz. 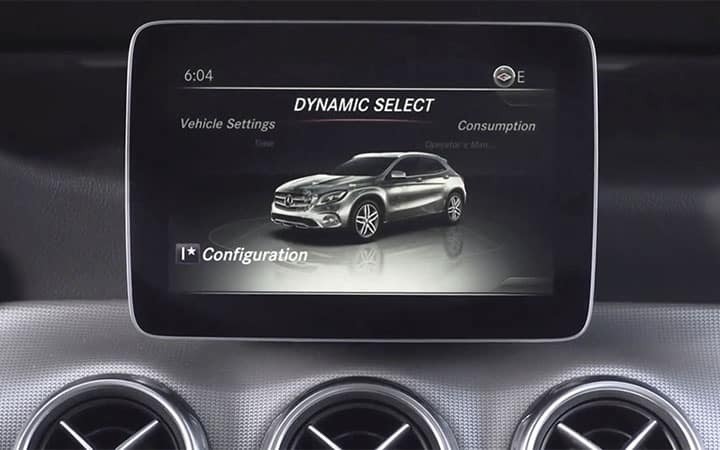 DYNAMIC SELECT dials in the GLA’s performance character with the tap of a console button. Throttle, shifting and more sharpen in Sport mode, ease up in ECO®, keep calm in Comfort. There’s even a mode you can set up yourself. See better by night. Look better by day. Available new LED headlamps flood the road ahead with light that’s brighter, whiter and more like natural daylight. Arching white LED Daytime Running Lamps and LED taillamps with new “Stardust” technology earn admiring glances coming and going. The compact GLA packs some sizable surprises. Its sensible footprint conceals a cabin that’s generous with legroom, headroom and luxury. And while it’s solid and strong, it also slips through the wind efficiently and quietly. More cubic feet. Opens with your foot. 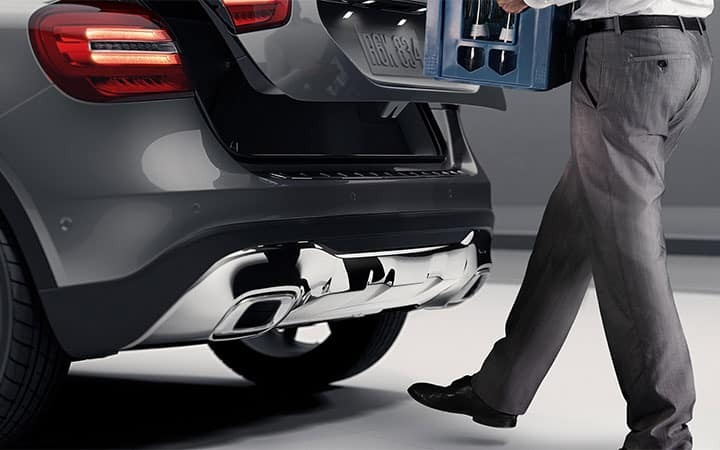 With the available HANDS-FREE ACCESS, just a “kick” under the bumper can open the standard power liftgate. It’s a grand opening to a generous space: 43.6 cu ft of cargo room with the rear seats folded, or a generous trunk with all five seats in use. Available only to qualified customers through Mercedes-Benz Financial Services at participating dealers through April 30, 2019. Not everyone will qualify. Advertised 36 months lease payment based on MSRP of $36,745 less the suggested dealer contribution resulting in a total gross capitalized cost of $35,096. Dealer contribution may vary and could affect your actual lease payment. Includes Destination Charge and Premium 1 Package. Excludes title, taxes, registration, license fees, insurance, dealer prep and additional options. Total monthly payments equal $13,284. Cash due at signing includes $2,553 capitalized cost reduction, $795 acquisition fee and first month’s lease payment of $369. Your acquisition fee may vary by dealership. The acquisition fee charged by the dealer may affect the total cash due at signing. No security deposit required. Total payments equal $16,632. At lease end, lessee pays for any amounts due under the lease, any official fees and taxes related to the scheduled termination, excess wear and use plus $0.25/mile over 30,000 miles, and $595 vehicle turn-in fee. Purchase option at lease end for $20,945 plus taxes (and any other fees and charges due under the applicable lease agreement) in example shown. Subject to credit approval. Specific vehicles are subject to availability and may have to be ordered. See participating dealer for details. Please always wear your seat belt, drive safely and obey speed limits. Mercedes-Benz of Music City	36.14284, -86.700609.